Release agents, bowling alley paste wax, honey wax paste, Honey Plus paste wax, Honey wax 100, fiberglass mold release, mold releases, and external mold release. Additional release agents are available on the Misc. release agents and Semi-permanent releases pages. Premium wax used in many shops as an economical release agent. Does not contain silicone. High content of naturally hard carnauba for durability and protection. Apply as any other paste wax or hard wax. Clean new mold and apply and buff-out several coats. After a first part, apply another coat or two and mold is ready for production. 4 or 8 cans/case but sold in any quantity. Save time with this simple, easy application. Hand buff only. Power buffing is not recommended. 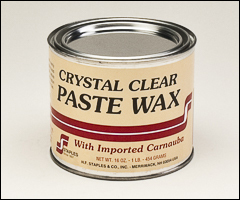 A high gloss paste wax that is specially formulated as a mold release agent for the fiberglass industry. Excellent release agent for boat building in the production of boat hulls and associated parts. Also used in the casting process in the manufacturing of marble sinks and tubs. A premium, high gloss paste wax, made with the purest carnauba wax, plus special binders and spreading agents. This creates a durable wax surface for multiple pulls and mirror-like finishes. Good release and high gloss to parts. Wax build-up is eliminated. Excellent ease of application and hand buffing characteristics. 12 cans/case but sold in any quantity. High gloss paste wax designed for fiberglass molders requiring production wax mold release agent that performs at high exotherm temperatures. Will withstand higher temperatures than most processed waxes when using high exotherm resins. Excellent for uses where reproducibility, glossiness, non-staining, and hard film are important. Also recommended for breaking in new molds or plugs due to its ability to provide a hard, durable, waxy film. 12 cans/case but sold in any quantity. Pure carnauba paste wax without any silicones, paraffins, or fillers. Designed for fiberglass molders who requires non-staining, purity, and a hard releasing film. Application is somewhat more exacting than for processed waxes, but the residual film is more durable and resistant to abrasion. Readily accepts PVA without fish-eyeing. 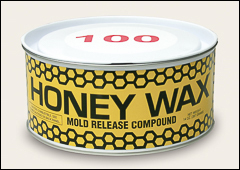 This wax will withstand higher temperatures than most processed waxes. Recommended for breaking in new molds or plugs because it will provide a hard, durable, and waxy film. Initially, on clean molds, apply three coats and buff after each coat. After this, single coats will give good release, high surface luster, and multiple pulls. In high humidity, it may be necessary to give your mold a final wiping with a clean dry cloth to remove any haze that develops from the unreleased solvents. Sold by the case, 12 cans/case.